Diagnosing Attention Deficit Hyperactivity Disorder (ADHD) remains subject to controversy and there is an ongoing debate about increasing prevalence rates. Comparing the findings of a meta-analysis for North America and Europe - showing a 7.2% worldwide prevalence in people age 18 and younger– to the prevalence rate of 11% in the US, one may argue that there is indeed a concerning difference. Not to mention the varying percentages of children with an ADHD diagnosis by state: from 5.6% in Nevada to 12.1% in Georgia and 18.7% in Kentucky . Given the well-publicised statistics, many question whether diagnosis is made too readily. Yet, surprisingly little attention is given to confounding factors that come into play when ruling out ADHD and to what extent bias, expectations, understanding and acceptance may influence a clinician’s decision making. We believe that objective data can help clinicians rule out ADHD, in this article we explore the subject and explain a little more about our ADHD tests. Patient understanding, and acceptance are considered keystones of care: they shape the ‘doctor-patient’ relationship, satisfaction levels, the experience of care and ultimately, outcomes. But there is work do to, not only to support patients and parents to understand their difficulties in a broader perspective and agree on realistic expectations, but also to empower clinicians to reach and communicate decisions confidently. Beyond behavioural concerns, the growing societal importance of education, and in the US related laws linking school funding to exam results, has led to increased pressure on patients and parents to seek an ADHD diagnosis. Some may hope that their difficulties are attributable to ADHD and resolved with a pill; expectations that can lead to an emotionally charged interchange during a clinical interview. But such parents are not to blame, in contrary, they and their child have been struggling, whether he or she has ADHD or not. It does, however, influence how information is elicited and understood and an incorrect ADHD diagnosis can result in unnecessary use of stimulant drugs and a significant delay to correct treatment. Whilst facilitating an accurate diagnosis already has challenges of its own, with many conditions e.g. Autism Spectrum Disorder, Developmental Coordination Disorder and emotional disorders all mimicking and overlapping with ADHD. During a consultation a clinician is tasked to consider all possible explanations for why a patient could be inattentive, impulsive and hyperactive; decide whether ADHD is present and then explain his/her decision – often in only 30 minutes. Within these time constraints, it is particularly challenging to rule out ADHD when the patient or parent strongly believes it to be the cause of their difficulties, and in this instance clear communication about how and why the clinician has made their decision is crucial. Without it, there is a risk for patient dissatisfaction and a patient or parent may move to another provider seeking a diagnosis. Empowering clinicians to make decisions confidently and communicate these clearly and effectively, will help them achieving the best outcome and patient satisfaction, which are essential for the effective delivery of healthcare. QbTest and QbCheck have proven to help clinicians to rule out ADHD with greater confidence in a way that is more acceptable and better understood by patients and parents . 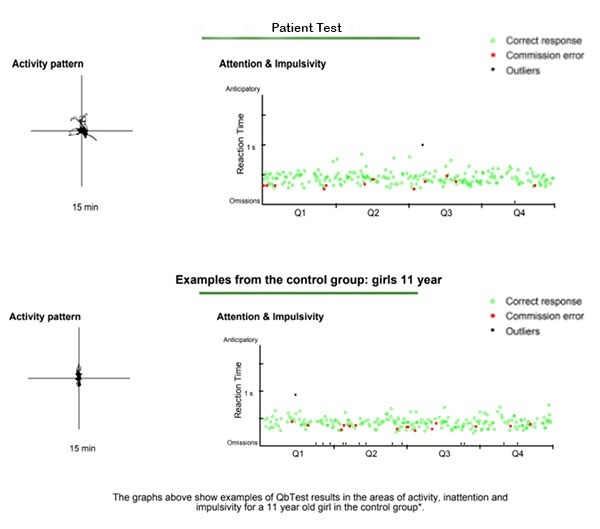 Objective data about the core symptoms of ADHD – Attention, Hyperactivity and Impulsivity – can help to rule out ADHD early in the diagnostic process and supports the clinician in his or her dialogue with patients and parents to explain why. The visual reports facilitate communication and provide insights about the root cause of symptoms and potential comorbidities. Closing the ‘ADHD door’ is an increasingly important part of high quality care, enabling clinicians to focus on alternative explanations for the symptoms experienced and identify appropriate support for their patients. If you wish to learn more about how our ADHD test products can help you, follow the links below.